Much ink has been spilled writing about how simple and straightforward social policy is better for ordinary people (here are two examples). When programs are complicated, ordinary people miss out on opportunities they are eligible for because they don’t understand the system. Similarly, complicated systems often allow the wealthy or better connected–with more resources to navigate the complicated system–to become the primary beneficiaries. Indeed, we previously saw how the mortgage interest tax deduction disproportionately benefits the wealthy, and that nearly half of people with mortgages do not even claim the deduction. However, Vienna has managed to cobble together a nearly incomprehensible set of policies to create one of the most affordable large cities in the world. The housing system is so complex that Virtual Vienna, an online resource for those relocating to Vienna, actually recommends hiring a lawyer before renting an apartment. Vienna’s affordable housing strategy relies on two very different forms of public housing, rent controls and other landlord-tenant regulations, and rental subsidies. No single part of this strategy is straightforward, and one expert estimates that the system is so complicated that only about 30-40 people actually understand it. Yet–despite its extraordinary complexity–Vienna has nearly unparalleled access to affordable housing. Overall, just 7.4% of all housing stock is for profit without any rent controls. Let’s take on each row, starting at the top, filling in details from Wolfgang Forster’s 80 Years of Social Housing in Vienna (Forster works for the City of Vienna’s Housing Research Department). First, protections for renters are so strong in Vienna that most people prefer to rent–even if they have the financial means to own. 78% of all housing stock is rental. So while the vast majority of housing in Vienna is rental, the vast majority of rental housing is public (58%)–in either of the two forms of public housing. Funk calls these two types of public housing “Community-owned flats” and “Cooperative flats”. Community-owned flats refers to public housing built prior to the 1980’s, where the City of Vienna is the owner and landlord. Since the 1980’s, new public housing has been built through a public-private partnerships (PPP) with a special type of nonprofit housing corporation. These newer public housing units still draw from the City of Vienna’s pool of applicants for public housing. Overall, public housing accounts for half of all housing stock by number of units of housing; Forster points out that 60% of all residents live in public housing. This post dives into the differences between the two types of public housing. Here, the focus is on the rent structure of each type of housing. For both types of public housing, it’s impossible to make a general statement what a typical family pays in rent. For public housing and other housing assistance programs in the United States, households are expected to pay exactly 30% of their income on rent. However, for Viennese public housing, rent is not based on income, but instead on the apartment unit: number of rooms, square footage, amenities, and other factors. Additionally, residents of Viennese public housing have a wide range of incomes. This is because–although only households below a certain income cutoff can apply to live in public housing–if a household’s income increases after they move into a public housing unit, they are not required to move. Because Viennese public housing is so affordable and desirable, people rarely move, leading to a wide mix of incomes. Housing costs for PPP public housing residents complicated by additional factors. Some residents are not renters; they actually own their unit. * And, the developer of PPP public housing can require down payments from residents to help finance the building’s construction up to 10% the cost of construction (low income applicants can get financial assistance for this). When residents move out, the corporation legally must pay those residents back their contribution to the down payment, with interest. In sum, it’s impossible to make a general statement about how much a typical household pays in rent in either type of public housing. Moving down Funk’s chart, the next category is for-profit rental housing (“Privately owned rental apartments”). At 292,000 total units, private, for-profit rental housing accounts for only one third of all housing stock. Yet of for-profit rental housing, a full 77% is subject to rent controls (“Subject to the full scope of the Tenancy Act). Only 23% of all private, for-profit housing is fully or partially exempt from rent controls (“Partially subject to the Tenancy Act / Exempted from the Tenancy Act”). This latter category is about 66,000 units, or just 7.4% of all housing stock. 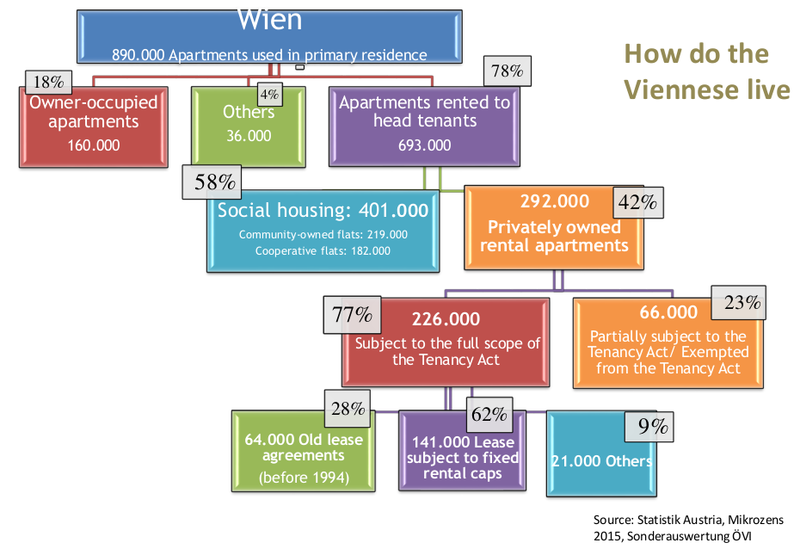 This is worth repeating: just 7.4% of all housing stock in Vienna is for-profit and free of rent controls. By law, any private housing built before before 1945 is subject to rent controls. Why is 1945 used as a cutoff? In the 1980’s, the City began a program to rehabilitate its old private housing stock. Overall, Vienna’s housing stock is very, very old: nearly 30% of all rental housing stock was built prior to World War I. Much of this old private housing stock had no bathrooms, running water, central heating, modern insulation, or many other essential amenities. In order to make Vienna a better place to live, the City decided to use public money to rehabilitate private housing. This effort is likely the largest urban renewal program in the history of the world, rehabilitating over 10,000 units per year; over 170,000 total units have been rehabilitated. But since public funding was being used to rehabilitate private housing, it made no sense to allow the landlords to collect higher rents based on renovations they didn’t have to pay for (and had proven for decades they were unwilling to make). Since these homes literally wouldn’t even have toilets without public investments, it made sense for these units to have rent controls. This is complicated enough. But remember, many units are actually exempt from rent controls. All units in buildings built after 1945 are exempt from rent controls, and–oddly–units created after 1945 inside a building built prior to 1945 are also exempted. As part of the urban renewal program, many attics in pre-1945 buildings were converted into apartment units. Because these converted attics were created after 1945, they are not subject to rent controls, even though the rest of the building’s units are. So in a building built prior to 1945, the sunny front units might get one price, the dreary rear units a second, a unit with slightly greater square footage a third, a unit with upgraded cabinetry a fourth, and the converted attic is unregulated. Often, a single building is subject to multiple different rent regulations. In sum, Funk estimates that rent regulations are so complicated that only 30-40 people actually understand the system well enough to advise real estate investors. Finally, it’s important to realize that unregulated private, for-profit rental housing has de facto rent controls. 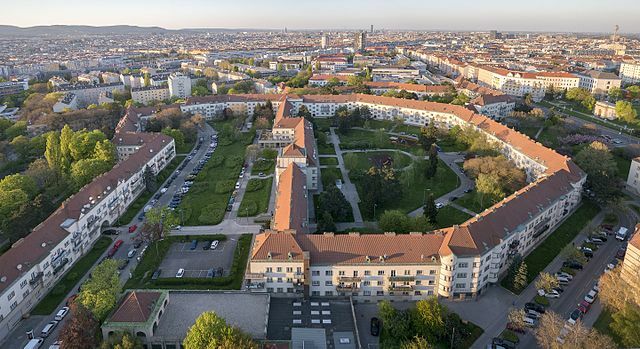 Since its inception, a major goal of Vienna’s public housing program has been to create a surplus of housing in order to exert a downward pressure on rents. This strategy has been very successful. Similarly, because for-profit, unregulated units must compete with a huge amount of public and rent controlled private housing, these units are unable to charge very high rents. In competition for tenants with so much affordable housing surrounding them, unregulated apartments have de facto rent regulations. In addition to expansive use of public housing and rent controls, Vienna utilizes many landlord-tenant regulations to help keep rents low. An important example is indefinite length of tenure regulations. Until very recently, the only possible rental agreement was indefinite–that is, there was no way for a landlord to end a lease (unless the tenant fell three months behind on rent or had damaged the property), but the tenant could end the lease at any time, as long as they had given the landlord 2 months’ notice. Indeed, the rental agreement could literally last forever: tenants can pass these indefinite leases on to their children under the exact same lease terms. Now, 3-year rental contracts are allowed–but only if the landlord offers a 20% reduction in rent–but indefinite contracts are still the norm. The box in Funk’s chart “Old lease agreements” refers to these indefinite leases which were originally signed before 1994. This is a powerful tool against rent inflation. Austria also has a housing allowance, or rental assistance for low income families. Since there is so much public housing in Vienna, few Viennese residents utilize this program. Clearly, Vienna’s housing system is extremely complicated. This occurred out of necessity. The rent control law and length of tenure regulations are actually national laws (oddly, dating back to a law enacted by the Hapsburg Monarchy in the turbulent final days of World War I). The city government of Vienna used these federal laws as the foundation of the city’s housing policy, first using public housing construction and the acquisition of land on the open market, and later using extensive renovations and PPP public housing, to fill in the gaps in federal policy. If there is a lesson for affordable housing policy from Vienna, it’s that no single reform is too small or too insignificant to make a difference. New housing reforms can be built upon a foundation of prior reforms such that they work together to ensure an affordable, equitable housing system. Finally, it’s crucial to note that just 7.4% of all housing stock is for-profit rental without rent regulations. Affordable housing and the profit motive do not mix; Vienna has ensured affordable housing for all its residents by largely removing the profit motive from the housing system. *Owner occupied units have deed restrictions that ensure that when a unit is sold, it can only be sold for an affordable price. **For old Viennese styles of architecture, the units in the front of the building have great sunlight, whereas the units in the rear of the building get very little sunlight. Later architecture used courtyards to eliminate this problem, but for the older buildings with this issue, the front units really are more desirable than the rear units and rent regulations reflect this accordingly. Previous Article Do you have a good face for radio? Next Article Just how loose is Milwaukee’s rental market? Vol 1 / Ch 2: What is a Community Land Trust? How can a single foreclosure cost a city $30,000? Copyright © 2019 Milwaukee Community Land Trust.